Dean Guitars SJ Art Series features exclusive designs by award-winning graphic designer Stephen Jensen. 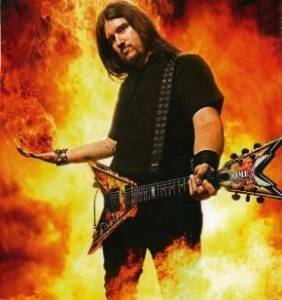 Stephen is no stranger to Deans Guitars working with them for several years and having designed the finishes of several famous guitars including Dimebag’s Rust Razorback, Explosion Razorback, Schenker Brothers V, and the Muddy Bullseye. With the SJ Art Series, Stephen brought to life three of our favorite designs to the Dean Guitars line-up starting in 2007. Designed as a classic tattoo design with a burning sacred heart and dagger rendered photo-realistically over tattoo style skulls and rose vines. Also features custom dagger and heart inlays. Solid mahogany with custom Revenge Heart Graphic and maple neck-thru construction provide jaw-dropping good looks and amazing, fat sound. Mahogany’s warm tone and sustain combined with string-through-body design will give you the tone and sustain you’ve always wanted. The Vendetta Revenge Guitar has powerful humbuckers that faithfully carry every shred and crunch to your amp. A modern take on classic hot rod flames, the Inferno features superheated blue flames and custom flame inlays. The Dean V Inferno Guitar features a custom blue flame graphic on the body, jaw-dropping flame fretboard inlay, and flame covers on the humbucking pickups! A string-thru bridge keeps your tone alive throughout the entire body. 22 fast frets facilitate wicked, shredding solos and lightning quick chord changes. 2 humbuckers with 3-way switching, volume and tone control keep things simple, yet tonally flexible. Being a Dean, the V looks as good as it sounds. The large, famous Dean headstock almost mirrors the V body. The Warbird is the camouflage theme taken to the extreme. This design features the battle ravaged hull of a camouflaged fighter plane complete with scratches, burn marks and bullet holes. Armed to the teeth with 2 humbuckers and a licensed Floyd Rose tremolo, this mahogany Warbird guitar also sports a set mahogany neck for great strength and tone transfer. A bound rosewood fretboard will keep you flying at top speed, and Grover tuners keep the enemies of tuning off your tail. The custom Army plane graphics have to be seen to be believed, and they’re accented with shining chrome hardware.